Could this Hempmobile Save the Planet? Home/Hemp Facts/Could this Hempmobile Save the Planet? Back in 1941, Henry Ford unveiled the first carbon neutral automobile that was made and powered by plants grown in American soil. Hemp played a key role in the composition of this revolutionary car that never made it to mass production because of political obstacles. More than 50 years later, a pioneering man from Florida has followed in Ford’s footsteps to create a hemp car he believes could save the planet. Bruce Michael Dietzen is the founder of Renew Sports Cars in Florida. He invested $200,000 of his own money to build a stylish sportster car that runs on biofuel and has a body made from hemp. The body of this green machine is made of three plies of woven hemp that were put into a mold, hardened with resin and then painted. This process created a body that is lighter than fiberglass and more dent resistant than steel. He believes that this car could play a pivotal role in stopping the progress of man-made climate change if others follow his example. Dietzen claims that his car is two and a half times greener than electric cars because, not only does it run on carbon neutral fuel, it’s body is biodegradable and carbon negative. How can he say that his hempmobile is carbon negative? He makes this claim because of the amazing carbon absorption of hemp. Like its sister cannabis plant marijuana, hemp removes carbon dioxide from the atmosphere 5 times more efficiently than trees. The fact that cannabis plants like hemp mature in just 3 to 4 months–unlike trees which take up to 20 years to mature–plays a key role in their efficiency. As a result of their high absorption of carbon, hemp plant fibers are rich in carbon. When hemp fibers are used to make a long lasting product like a car, that carbon remains in the product instead of being released back into the atmosphere as it would be if the plant were simply to die and biodegrade. This is known as carbon sequestering. Carbon sequestering is essential to reverse the impact of man-made climate change. As environmental and hemp enthusiasts, we hope that Dietzen’s green machine will inspire other car manufacturers to follow in his footsteps. Can you imagine being able to help reduce climate change with every mile that you drive? 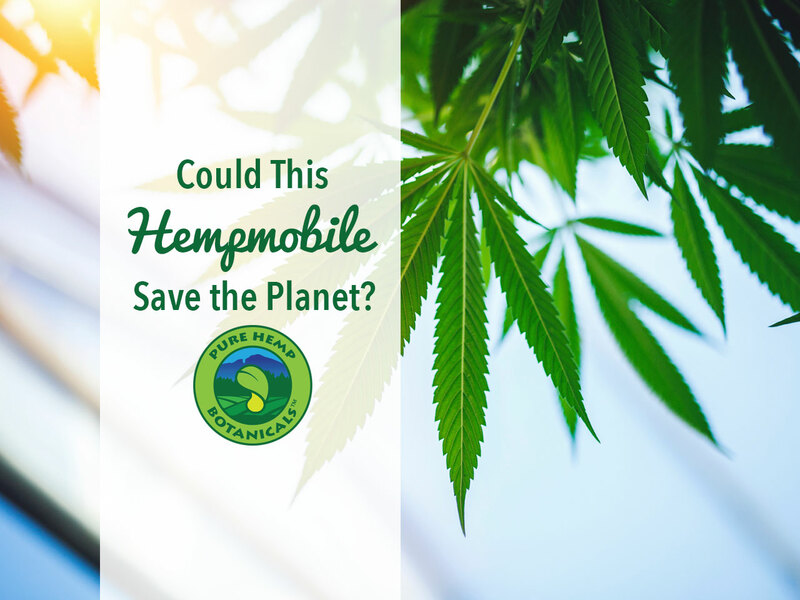 We hope that the large scale production of hempmobiles like Dietzen’s, along with other valuable hemp goods, will play a pivotal role in convincing the federal government to rethink its stance on hemp. We are fortunate to be in one of the few states where hemp can be legally cultivated. As a Florida resident, Dietzen was not as fortunate. He had to import hemp from China to make his car because it is still illegal to grow hemp in his state. Even though hemp contains 0.03% or less of the psychoactive compound THC (delta-9 tetrahydrocannabinol) it has been vilified along with its sister cannabis plant marijuana. (Marijuana contains 5% to 20% of THC). The federal government considers hemp a Schedule 1 substance along with marijuana because it does not distinguish a difference between these two cannabis plants, which is why they are illegal to grow in most states. If you share our belief that American farmers should be free to grow hemp in all 50 states because of the incredible value of this environmentally friendly plant, please sign the petition to urge congress to pass the Industrial Hemp Farming Act. This critical piece of legislature would remove hemp from the Controlled Substance Act (CSA).